Pedestrians during flake sightings last month; an inch or 2 is possible this weekend. The forecasts suggest that schools and businesses won’t have to shut down on Monday, but the region is expecting a general 1 to 2 inches of snow from Saturday night into Sunday. More could fall at the Shore with the ripening of a coastal storm off the Carolina coast, with perhaps up to 4 inches. "If it tracks a little farther north, you might see those numbers come up a little bit,” Sarah Johnson, a meteorologist with the National Weather Service Office in Mount Holly, said Friday. But in and around Philadelphia, and especially to the north, the Arctic air mass that has chilled the region with the coldest air mass of the season is offering a measure of protection. The first flake sightings should occur in Philadelphia between 7 and 9 p.m. Saturday, said Dave Dombek, a meteorologist with AccuWeather Inc., and it all should be over before noon Sunday. The snow will be light, although “during the overnight at times it might be a little bit beefier,” he said. Although the precipitation amounts would be paltry, since temperatures will be in the 20s the snow-to-liquid ratio should be high. Less than a tenth of an inch of liquid could produce an inch of snow. 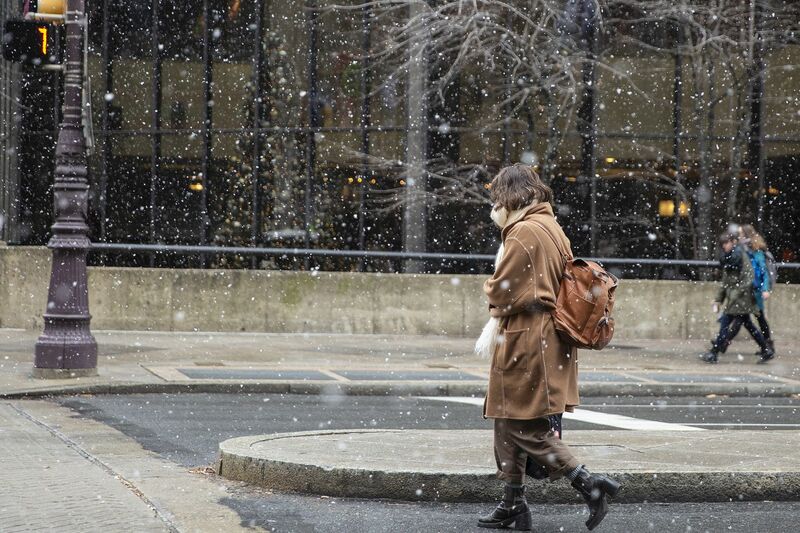 The snow that falls in Philly actually would more likely come from a storm to the west. “This is the low that’s already bringing some snow to St. Louis,” Johnson said. That was due to transfer its energy to the coastal storm, forecast to intensify Saturday. If the forecast is right, this would be the biggest snow since the 3.6 inches in mid-November. Not surprisingly, this winter hasn’t exactly taxed salt supplies. PennDot’s Philadelphia region has 125,000 tons of the stuff on hand, said spokesperson Brad Rudolph; it used about 117,000 in each of the last two winters. He said 320 trucks will be dispatched Saturday evening. On the principle that what might happen is usually more interesting that what is happening, attention already has been turned to a winter storm threat for next weekend. Rudolph said he’d already heard about it.